If you’ve been around the health and fitness community for any length of time – particularly online – you’ve more than likely encountered “IIFYM.” Short for “If It Fits Your Macros,” this term has spread across the internet and has gone from being a pithy piece of nutritional advice to defining a whole diet. So, what exactly is IIFYM and what should you know about it before fully embracing the concept? The idea represented by those five letters is that you can essentially eat anything you want, as long as it stays within your limits of total calories, protein, fat and carbohydrates – macronutrients (macros). Eventually, this simple phrase spawned an entire diet and subgroup within the fitness community. The idea behind IIFYM – sometimes called flexible dieting – has definite merit. Allowing yourself the freedom to enjoy “treats” occasionally without being overly concerned with what you’re eating is a proven way to prevent discouragement and burnout while dieting. And, for many people, this is all that IIFYM means. But for many others, the phrase has become an excuse to indulge in junk food… IIFYM. Writing for Breaking Muscle fitness expert Kyle Hunt, himself a flexible dieter, made some interesting comments on this. Hunt even states that this is a misconception about IIFYM that started with memes on social networks, depicting all sorts of junk food, put out there just to poke at clean-eaters. But the truth is that there are people who jump on the IIFYM wagon using these memes to set their dietary standards. Flexible dieting is a liberating and effective way to eat. But you should not ignore quality of calories. If you were to compare 200 calories of walnuts to 200 calories of potato chips, the walnuts would doubtless give you a better nutrient profile. There is also the concern that chips – and many processed foods – contain artificial additives that increasingly demonstrate negative health effects. Many processed foods, for instance, contain emulsifiers that studies have shown can damage gut bacteria in a way that significantly increases the risk of obesity, diabetes and digestive conditions. The same can be said for artificial sweeteners. By all means, enjoy your food and do not feel like you need to heavily restrict your diet. But don’t go to the other extreme and disregard the quality of a calorie. Can Prebiotic Fiber Help With Weight Loss? Dietary fiber is sort of an odd thing, nutritionally speaking. It is vital for our health and significant amounts of it are recommended each day (38g for men, 25g for women) – but our bodies can’t actually digest it. Still, this tough stuff has been connected to a huge number of health benefits, including improved digestion, reduced cholesterol, balanced blood sugar and – most famously – weight loss. This ability of fiber to help you achieve a healthy weight has really been the reason that so many people pay attention to it. We have known for a long time that fibrous food tends to contain fewer calories while making you feel fuller for longer periods – thus preventing you from overeating. But, recent research shows that a surprising mechanism is at work here. It’s an odd and somewhat off-putting concept, but there are innumerable microorganisms living inside of your digestive tract. The existence of this gut bacteria isn’t a newly discovered fact, but experts are only just starting to understand the impact that these little bugs have on our health. In a new study from the University of Calgary, a team of researchers demonstrated a powerful and surprising link between dietary fiber, gut bacteria and weight loss. Mice that were fed a high-fat, high-sugar diet were split into two groups: the control and those fed dietary fiber in addition to the diet. It’s very important to know that the fiber was a particular type, called oligofructose. At the end of the study, the team reported that the fiber-fed mice gained much less weight than the control group. The reason that oligofructose was used in this study is because this specific fiber is known to act as a prebiotic – a nutrient that is especially useful to your but bacteria. While the exact mechanisms are not fully understood, it’s clear that oligofructose changed the gut bacteria of the mice in such a way that weight gained is restricted. Previous studies have demonstrated this property in humans but this study was the first to look closely at effects of the fiber on gut bacteria. It’s also interesting to note that the oligofructose changed the hormone profile in mice so that they felt full longer and therefore craved less food. But, as always, we need to be clear that there is no magic bullet for weight loss. Oligofructose alone should not be seen as a replacement for healthy eating and regular exercise. The fiber could be used, though, to give your otherwise healthy lifestyle an extra boost. When we talk about working your abs – or core – the first thing most people think of is the classic crunch. And, don’t get me wrong, the crunch has it’s place. In fact, according to two separate studies – one in 2001 and the other in 2014 – both conducted by the American Council on Exercise (ACE), the crunch is still the best overall core exercise. Sort of. For one thing, many people just do the crunch wrong and end up either limiting the effectiveness of the exercise or causing injury to their lower backs. Many more have preexisting injuries that stop them from even attempting the crunch. But another issue comes up when you consider the mechanics of human movement. Your core is just not made to be doing much while you’re lying down. Those muscles are meant to keep you upright and moving correctly. So, it stands to reason that the best way to work them would be while you’re standing up. What follows are some simple exercises that you can do to work your core while standing. These having the added benefit of training your balance and stability – aspects that are very valuable to the athlete. Woodchoppers – Stand with your legs about shoulder-width apart so that your left leg is slightly ahead of your right. Hold either a medicine ball, a dumbbell or a cable handle in both your hands with the weight resting on your right side and your arms straight. Keeping your knees soft lift the weight up and across your body so that it comes above your left shoulder. Slowly return to starting position. Switch the position of your feet and weight to work the right side. Around-the-worlds – Stand with your feet even, about shoulder-width apart. Hold a medicine ball or dumbbell in both your hands, with the weight resting in front of you and your arms straight. Tighten your core to stay upright and swing the weight in a wide circle, clockwise around your body. Keep your arms straight throughout the movement. After 10 reps, pause and reverse direction. Side bends – There are several ways you can work the side bend movement, but holding the weight above your head adds a challenging element that can help improve balance and posture more than the traditional take. Stand with your feet at shoulder-width and hold a weight above your head. Keeping your arms straight and your knees soft, bend your torso as far as you can to the left. Slowly return to center before repeating the movement on your right side. Try adding these movements to your normal workouts as a way to improve, not only the strength of your core, but also your balance and posture. 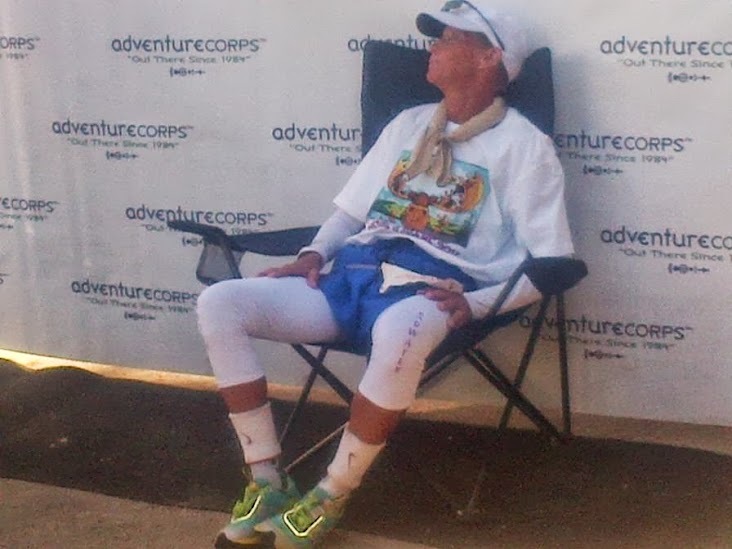 I finished a race yesterday out in the desert. Sweat beaded up on my forehead and I felt thankful I applied at least some sunblock before crossing the start line. Although temperatures aren’t blasting yet all over the country, it will happen sooner than later. I found a recent study offering a new way for athletes to combat high body temperatures. In Wilderness & Environmental Medicine, heat stroke kills thousands of people and is the leading cause of death among young athletes. Be forewarned: heat stroke kills. You can prevent heat stroke with proper hydration and limited outside workouts during the hottest parts of the day. Before heat stroke occurs, you can watch for the warning signs for heat exhaustion–its precursor–which include heavy sweating, clammy skin and nausea. If your body temperature reaches 103 degrees Fahrenheit, however, you will be susceptible to heat stroke. The authors of the study found a way you can ease heat stroke should it occur: apply cold packs to the hands, cheeks and feet. These are three areas of the body in which blood vessels don’t contract when cold packs are applied. In the study, the researchers had 10 visibly healthy men wear military clothes specially designed to trap heat and then had them walk on a treadmill for 30 to 40 minutes in a room heated to 104 degrees Fahrenheit. All 10 completed a treadmill test three times, resting at least one day between each trial for recovery purposes. On the first test, they received no treatment for lowering body temperature. The second time researchers gave them cold packs and applied them to the armpits, neck and groin. On the third test, they received cold packs on their hands, cheeks and feet. Body temperature after first test with no cold treatment: 101.8 degrees Fahrenheit after 10 minutes. Body temperature after second test with traditional cold treatment: 101.5 degrees Fahrenheit after 10 minutes. Body temperature after third test with new cold treatment: 100.9 degrees Fahrenheit after 10 minutes. Although not a perfect test because the researchers only used healthy, young males, these are significant results. You should be aware of how to help yourself or other runners when faced with symptoms of too much heat. Does Unstable Surface Training Work? If you walk into just about any training facility anywhere, you’re likely to see instability training equipment – even if you don’t recognize it by that very clinic name. Sometimes called “unstable surface training,” this approach uses things like Swiss balls, BOSU balls and suspension trainers to challenge your balance while training for strength. The idea is that this extra element will help you make faster progress, especially in core strength and balance, than tradition strength training would. For athletes in most sports, this seems like a profitable concept. After all, improving your balance can both reduce risk of injury and increase your overall efficiency of movement. With claims like that, it makes sense that what was once a training modality limited to rehabilitation has quickly spread into the athletic world. But, we have to asked the unfortunate question: Does it work? Looking at the classic uses – that of decreasing lower back pain and encouraging recovery from injuries – it seems like unstable training does work. Numerous studies have shown that resistance training performed using these unstable surfaces can challenge the core and other muscles in such a way that these aspects of fitness significantly improve. Studies have also backed up the use of unstable training as a way to prevent injury in athletes. Specifically when it comes to the all-too-common knee and shoulder injuries, regularly incorporating unstable surfaces into your strength training program can help to condition your muscles so that they operate in a balanced way – preventing problems down the road. This “does it work?” question becomes a little messy, though, when we get into the world of strength and power. All of the above-mentioned benefits of unstable training could be invaluable to you in various stages of your training. However, the balance-testing element of it could also limit your development of both strength and power. Because your muscles and joints are struggling just to keep you upright, unstable training prevents complete muscle activation. Put simply, your body just has too much going on to worry about fully contracting your muscles. Without forceful muscle contractions, you will not see the same increased in strength that you might from a more traditional program. A recent study in the Journal of Sports Science & Medicine, though, compared the benefits of a traditional circuit workout versus one performed on unstable surfaces. Keep in mind that circuit training is typically not focused on developing strength, but usually shows more general improvements in fitness. At the end of the trial, there was no significant difference between the two programs in strength, power, speed or jumping ability. This means that, when it comes to circuit training, you can have your pick between stable or unstable training. Since unstable training requires specialized equipment and can be more difficult, though, it doesn’t seem to be worth it.